DEKING Screw Products Is AS91000 and ISO 9001:2008 Certified! | DEKING Screw Products, Inc.DEKING Screw Products, Inc. | Your full-service supplier of precision machined products since 1962. 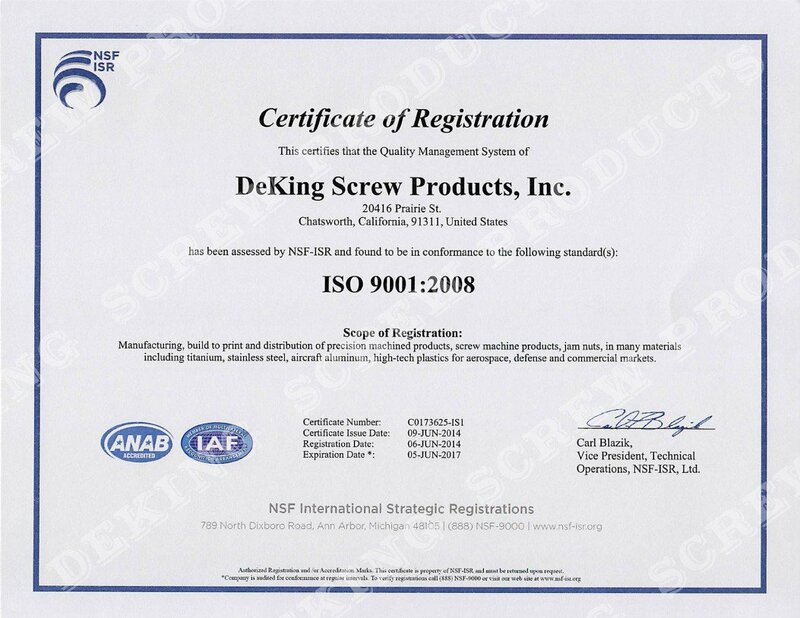 | DEKING Screw Products Is AS91000 and ISO 9001:2008 Certified! DEKING Screw Products Is AS91000 and ISO 9001:2008 Certified! We are extremely proud to announce that DEKING Screw Products, Inc. has now been certified to the ISO 9001:2008 and AS9100 standard of quality. Ever since 1962, we have been building high quality products, and now our service has been formally recognized by the International Organization of Standardization (ISO). The ISO 9000 family of standards is concerned with “quality management”, and what a particular organization does to enhance customer satisfaction by meeting customer requirements and to continually improve its performance in this regard. For more information on ISO 9001, visit the International Organization for Standardization’s website. ISO 9001 is the most comprehensive level of certification, accepted by 90 countries around the world. It provides third-party assurance that we have the quality management to ensure all operations are consistently of the highest quality. Also, it recognises that no two projects are ever the same, so we don’t operate a ‘one size fits all’ approach to our work. Instead we look at the best approach to take on each project to achieve the best outcome, working in a collaborative way to make sure that everyone understands, and are happy with progress, at every stage of the project. What does this mean for DEKING Screw Products? For DEKING Screw Products, it confirms that we are not only doing work that is right for us as a business, but for our clients as well. Ultimately, this means we are likely to do more work with them in the future that will enable us to grow as a company. It means we have a process for reviewing how effective we are, identifying areas for improvement and new ways of working that will increase our efficiency and ensure our staff work in an environment that is stress-free as possible. DEKING is located in Chatsworth, California, 20 minutes north of Los Angeles. Welcome to DEKING Screw Products, Inc., your full-service supplier of precision machined products. We are a third-generation screw machine job-shop. DEKING provides the highest quality precision parts, screw machine products, sub-assemblies, and jam nuts for your prototype or production needs. DEKING is experienced with a broad range of materials including titanium, stainless steel, aircraft aluminum alloys, carbon / tool steels and the high-tech plastics, as well as forming pieces for different sectors including aerospace, defense, and commercial. We also do customer-print manufacturing. With our ISO-certified Quality Control program, combined with our ongoing Lean Manufacturing and many years of experience, DEKING maintains an award-winning quality record. DEKING offers customer support with design improvement and cost reduction consultation. We work hard to keep our customers happy. ©2019 DEKING Screw Products, Inc.